INCOMPATIBLE with TV Sticks, (such as Fire Stick, Roku, Chromecast), mobile phones and iPad series. Please hook up the USB power cable to 5V power plug before use. Support PAL and NTSC two standard TV formats output. Plug and play without any drivers; Portable and flexible. 2.0 out of 5 starsReturned for credit, doesn't work with Spotify or Galaxy phone. Returned for credit, doesn't work with Spotify or Galaxy phone, works with iPad. 5.0 out of 5 starsSuperior product for adapting new to old. This product is superior for connecting hi-tech equipment to older equipment. For the test I connected an older Roku box that has both the HDMI and composite output. 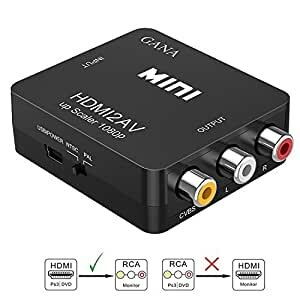 Using the HDMI output of the Roku, I connected the cable to the converter and then used the existing composite cable coming out of the converter. The results are fantastic. One tip though. You need to reset your device in order for it to recognize the port being used, otherwise the image will not appear correctly. Also, this unit does not come with a USB adapter for a standard outlet. You'll need to purchase that separately but it does come with the USB cord for powering straight from a computer. 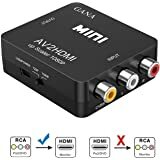 This device also has a built in self test color bar pattern making sure that your video signal is working properly to the monitor or television. Highly recommend this product to adapt older TVs and monitors with newer equipment, such as the high end Roku boxes. No need to recycle those old televisions as long as they still work. Since the Sirius radio MET Opera broadcasts on Dishtv no longer allow recording to the dvr, I wanted to find a way to capture the performances on media. Since only audio is broadcast, the video quality was a non factor. I could do it with a thumb drive connection but I also wanted the ability to permanently archive the performances to disk. I got this device to accomplish my goal and hooked it up like this: HDMI out from Dishtv receiver to switch box. 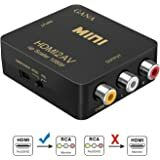 HDMI out from switch box to the MINI input. RCA out from MINI to Toshiba DVD recorder. No reason to use the usb power source as it worked fine without it. I pop a disk in the dvd recorder, switch to the Opera channel, set the timer on the dvd recorder according to the length of the opera, and I'm good to go. Works fine for this audio only application, although I can see where the degradation in picture quality might make it a poor choice for movies or sports. 5.0 out of 5 starsThis thing is great ! 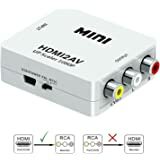 This little item is just the ticket you need if you have video on your laptop that you want to watch on TV, but your TV does not have an HDMI input slot. Yep, some of us have older TVs that don't come with all those new fangled input slots, or maybe you want to run it through a VHS or DVD player which doesn't have all the bells & whistles. Well this does the job, and it is very easy to use. Everything I wanted use it for a optical audio to my studio speakers from my TV to play spotify off my playstation. Though it isn't the best set up, works on my budget. It does however need to be powered and has a little red light on it, I dont know how I feel about that but its there. It works as described, but does give you some signal loose. So the quality is not as perfect as we might hope. 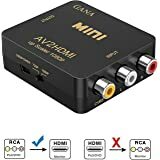 But it does allow you to hook up your HDMI device (ie: A firestick) to your analog TV, VCR, DVR, PC inputs, etc. It allows for a variety of applications. The Tech support team even contacted me after delivery to insure I was pleased with my purchase!